The Super Dimensional Fortress Public Access Unix has now been in operation for 20 years ! SDF is a non-commercial member supported BBS, which offers free accounts with Unix shell access, and a friendly and vibrant community. I’ve been a ‘lifetime’ APRA member for a few years now, and have been using SDF for some lightweight web hosting (CGI in various flavours is supported). It’s really handy to have a reliable shell account somewhere out in the aether to check network connectivity from, and my interactions with the community have always been fun. 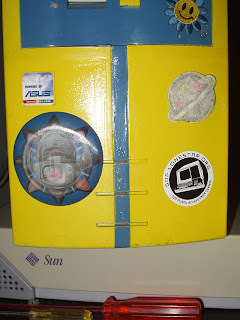 The photos in this post show one of my aging PCs, proudly displaying an SDF sticker. 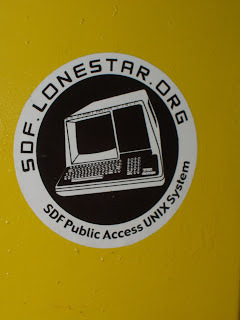 To get a free account and check it out for yourself, telnet to sdf.lonestar.org and login as new. (yeh, I know I labeled this ‘linux’, and SDF actually runs on NetBSD. Different OS, similar audience). Okay, okay, so this news is a few days stale, but the outrage has only just hit me …. In a sermon delivered in Arabic (but thankfully translated by The Australian for the sake of some racial-hatred-arousing journalism) Sheik Taj Din al-Hilaly has compared men to cats which have no free will and cannot help but eat uncovered meat left out on the street. As a red-blooded Aussie male, I’m extremely offended at being compared to such a prissy weak rotting-meat-on-the-street eating animal. Maybe something more masculine like a rhinoceros or a Great White Shark may have been a more thoughtful comparison on the Sheiks part … even a “big cat” such as a lion wouldn’t be so bad. But a feral flea bitten moggy eating uncovered meat on the street ! This guy should aim to improve on his metaphors.